Brent crude rose more than 1% to $80.13 – the first time it has breached $80 since late May. 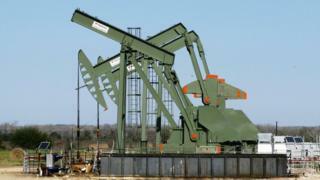 “Iran is increasingly becoming the preoccupation of the crude market,” said consultants JBC Energy. Gordon Gray, HSBC’s global head of oil and gas equity research, said there were “real risks” that Brent could hit $100 a barrel. “The fact that much higher supply is already needed from the likes of Saudi Arabia – and the low levels of spare capacity remaining – leave the global system highly vulnerable to any further significant outage,” he said. Opec, the Organization of the Petroleum Exporting Countries that accounts for 40% of global production, cut its forecast for oil demand growth next year in its monthly report. Oil traders were also watching the progress of category 4 Hurricane Florence, which is expected to make landfall in the US by Friday. US crude rose 91 cents to $70.16 a barrel. In January Brent crude hit $70 a barrel for the first time since December 2014.